Concerts for children - fluegelschlag-quartetts Webseite! Presenting modern chamber music to children and young persons is part of the Flügelschlag-Quartett's educational work. They conduct moderated concerts and workshops for pupils and students of all kinds of schools who thereby have the chance to get to know works by different composers as well as their particular musical creation. For those events groups of students and classes attend the ensemble's concerts or Flügelschlag-Quartett visit schools. The four musicians themselves conduct these school or family concerts and explain the construction techniques of their different musical instruments. By playing some excerpts of their works they show how many different instruments are used in compositions. 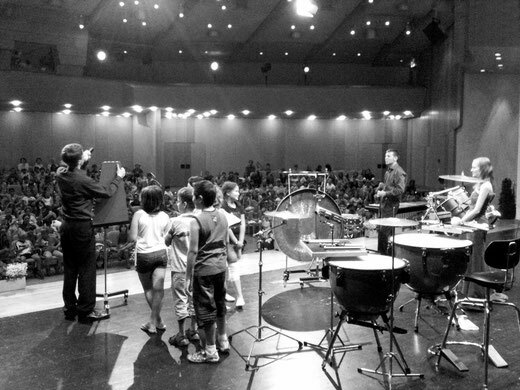 Therefore also the audience is included: for example some children are given the chance to come on stage and try some notes on the instruments. Depending on the age of the audience, specific programmes for certain subjects can be arranged, like fairy tales, programme music or music of the 20. and 21. century.